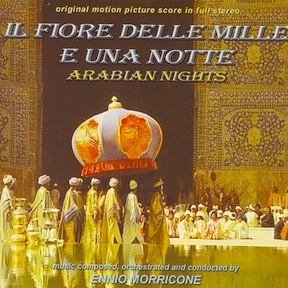 Ennio Morricone's Il fiore della mille e una notte (Arabian Nights) is the 281st Sountrack of the Week. The music cycles through about half a dozen themes. "Tema di Aziza" is somewhat pensive, with a thoughtful harp line. The harp gets flightier for "Tema di Dunja" and is the center of attention before handing off the melody to woodwinds.. As in the first theme, the orchestra creates a subtle background for these lines. Most of the rest of the themes are for solo church organ. "Tema del Demone — Primo" and "Tema del Demone — Secondo" are both longer pieces, the first is in the upper register, the second in the lower. The "Primo" is reprised as "Tema della battaglia". Other solo organ cues are "Tema della Montagna di Pietra Nero", "Misterioso", "Mistico" and "Rituale". This is a great record to listen to if you're in the right mood!